Patients with schizophrenia commonly report problems related to disturbed sleep, most often presenting as difficulties with sleep onset latency (SOL) or with sleep maintenance, whereas others have identified disrupted circadian sleep control such as phase delay and even free running cycles. Several studies have evaluated objective measures of sleep abnormalities in patients with schizophrenia by means of polysomnographic techniques. While the majority of published reports are associated with substantial methodological problems that confound interpretation of the data presented, some consistent patterns of findings can be observed across a number of studies examining sleep physiology in schizophrenic patients. The most consistently reported findings have included prolonged SOL and increased wake time after sleep onset (WASO). Additionally, some studies reported diminished slow-wave sleep (SWS) time in patients with schizophrenia as compared to healthy controls, and other studies noted short REM latency (REM-L). However, the latter two findings were not as consistently replicated across studies. Considerable progress has been made in recent years in delineating neurobiological mechanisms involved in the regulation of sleep and wake states as well the coordination of transitions within sleep from one state to another (e.g., regulating transitions from non-REM to REM sleep stages). 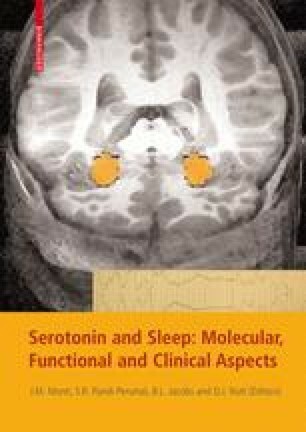 In addition to the major excitatory and inhibitory neurotransmitter systems glutamate and GABA, monoamine neurotransmitter systems, including dopamine (DA), norepinephrine (NE), serotonin (5-HT), acetylcholine (ACh) and histamine have all been demonstrated to play important roles in the sleep state regulation process. Antipsychotic drugs, including both the typical and atypical antipsychotic classes, have all been shown to produce prominent inhibitory effects at DA D2 receptor sites. Additionally, to varying degrees, different antipsychotic drugs produce modulatory effects on 5-HT, NE, ACh and histaminergic receptors, thereby providing a strong rationale for anticipating prominent effects of antipsychotic drugs on sleep physiology when administered to patients with schizophrenia, other psychiatric disorders as well as to healthy control subjects. A number of studies have reported data on effects of antipsychotic drugs on sleep measures in patients with psychiatric disorders and in healthy control groups. Many of the published reports are noted to have significant methodological limitations, making interpretation of the findings tenuous in some cases. Nevertheless, some consistent patterns of findings have been reported to date. In general, administration of typical antipsychotic drugs has been noted to result in improved sleep continuity, as characterized by increased total sleep time, increased sleep efficiency and decreased SOL and WASO. In these studies, SWS was generally not altered but REM-L was occasionally increased. In studies examining effects of the atypical antipsychotic drugs, generally similar patterns of improvement of sleep continuity measures have been reported across the various agents in this class, but some differences have been noted in terms of effects on SWS and on parameters of REM activity. Differences in effects of various atypical antipsychotic drugs on sleep may be explained by their differing pharmacological mechanisms of action. Substantial limitations are noted in terms of the studies of effects of atypical antipsychotic drugs on sleep. For several of the drugs in this class, no published studies have characterized their effects in the clinical populations in which they are used most extensively. Thus, there is a need for much further work in this area of great clinical importance.